Vancouver, British Columbia--(Newsfile Corp. - January 9, 2019) - ML Gold Corp. (TSX-V: MLG; FSE: XOVN.F) ("ML Gold" or the "Company") reports the final three holes of the 2018 diamond drilling program. Porphyry copper mineralization has now been intersected in holes 014, 015 and 016 (DD18SS014 - DD18SS016). 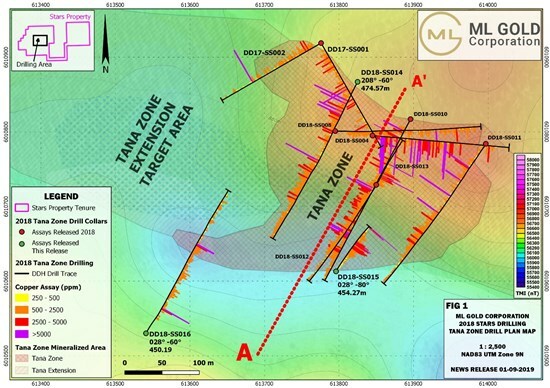 Well-developed copper mineralization discovered at the Stars Project has a mineralized strike length of greater than 400 metres, width of greater than 200 meters and depth of greater than 350 metres and remains open in all directions. Significant intersections from the final three holes are set out in table 1 below. The Stars Project is located in Central British Columbia, Canada, 60km southwest of the resource town of Houston, B.C. The project site is low-elevation, gentle topography, and is accessible by all-season main line resource roads. 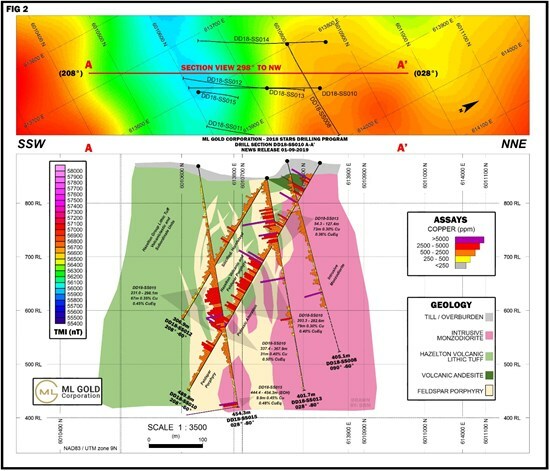 Figure 2: Drill cross-section A-A' from Figure 1 at the Stars Project; top image: plan map showing sections location over airborne magnetics; bottom image: cross-section with copper assays and geologic interpretation.